Smite giveaway: Ultimate God pack and 1500 gems! 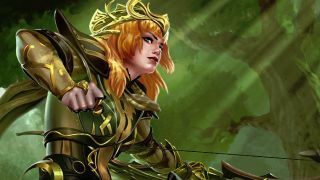 Find the rest of our Smite coverage right here. To get started with SWC 2015, check out our FAQ. Let's get right to it: you know why you're here. We've got twenty Smite codes to give away, each granting an Ultimate God Pack and 1500 gems. For the uninitiated, that means every current and future character in the game as well as enough in-game currency for 3-5 cosmetic skins. Given the value of the prize, it feels fair to make you work for it a little bit. Follow @PCGamer and tweet us with your idea for a pun-based cosmetic skin for an existing god. I'd like you to do this because I've been thinking of Ah Muzen Cab as 'Amusing Crab' for the last two days and would like to fill my brain with different puns. If you're new to the game or need ideas, you can find the full list of gods on the official site. The twenty best will receive their codes via Twitter DM and have their entries appended to this post for all to see. I'll be judging the contest and giving out codes after the close of play today, so your deadline is 10pm EST/3am GMT. Here are nineteen of the twenty puns that we thought terrible enough to reward. We're missing one, because we didn't get permission to post it here. Good job, all.